Vanita Blundell has been selected to help with the marketing of the house you have been waiting for! 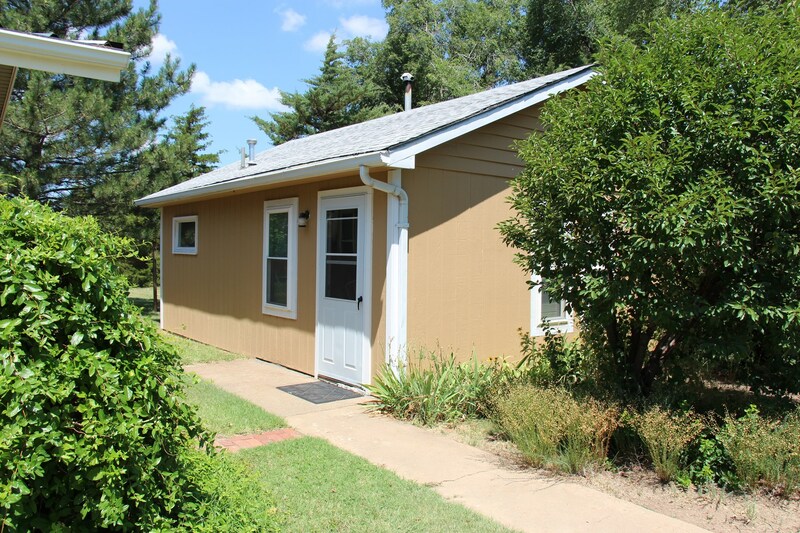 This home would make a perfect home for a growing family or those looking to retire in a small, safe community. 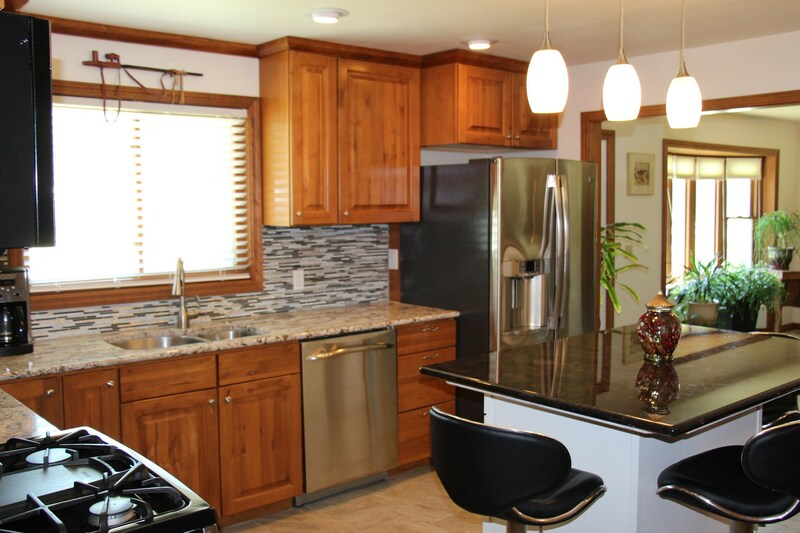 This beautiful home has been meticulously remodeled and updated throughout. 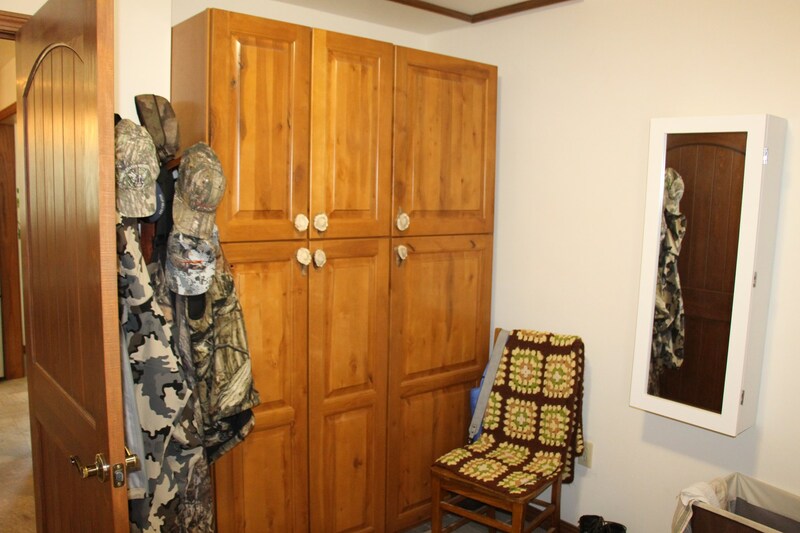 Along with this 2 bedroom and 2 bath home, is a separate mother-in-law cottage (hunting cabin). 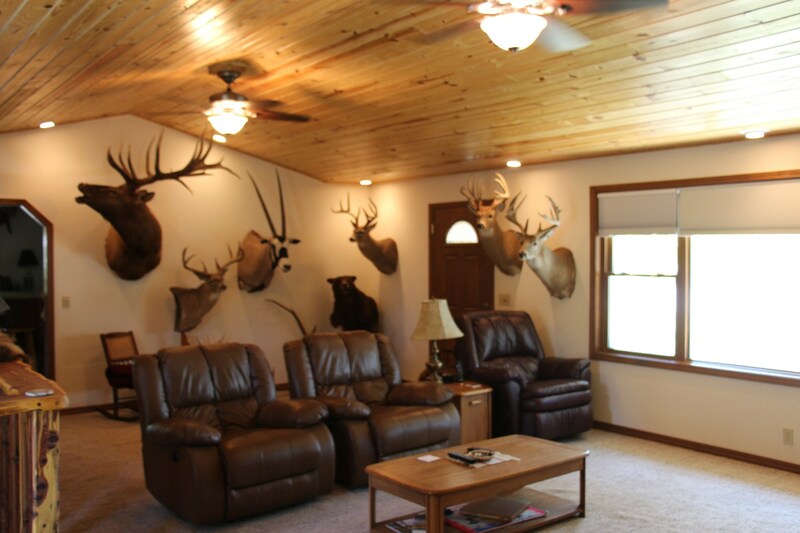 This amazing hunting lodge and luxurious family home is located in the heart of some of the best hunting country in the State of Kansas. 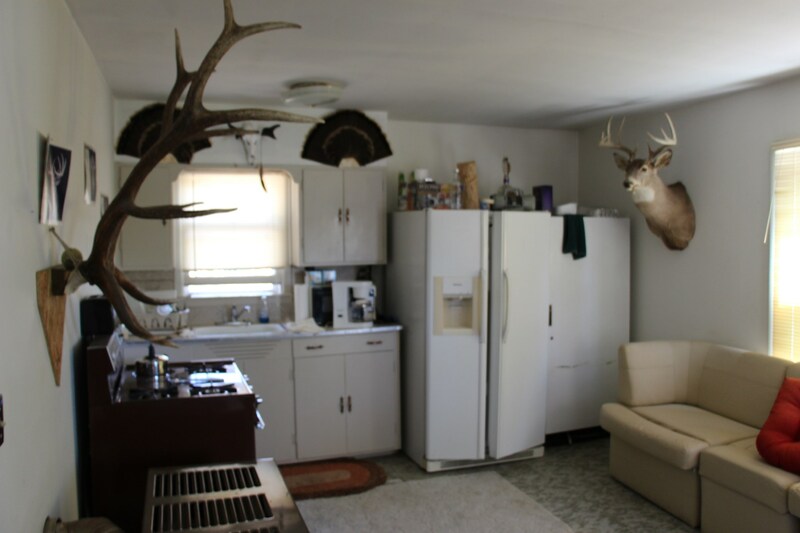 In fact there are over 20,000 acres of Walk-In Hunting land just in Clark County where Ashland is located. 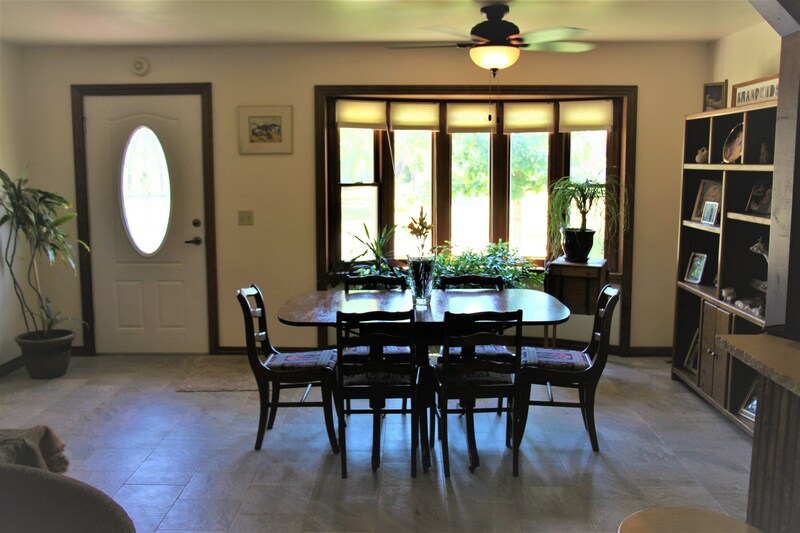 One tract with about 9,000 acres of land is within 4 miles of this spacious home. For more information click on the Clark County Walk-In Hunting Area Map document shown above. 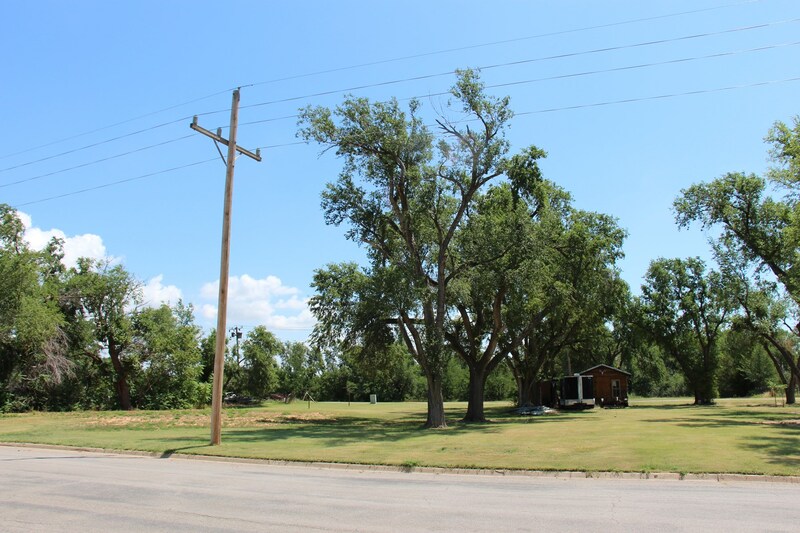 In addition to this spacious home site, the sellers are offering 2 other building sites across Cedar Street to the east. 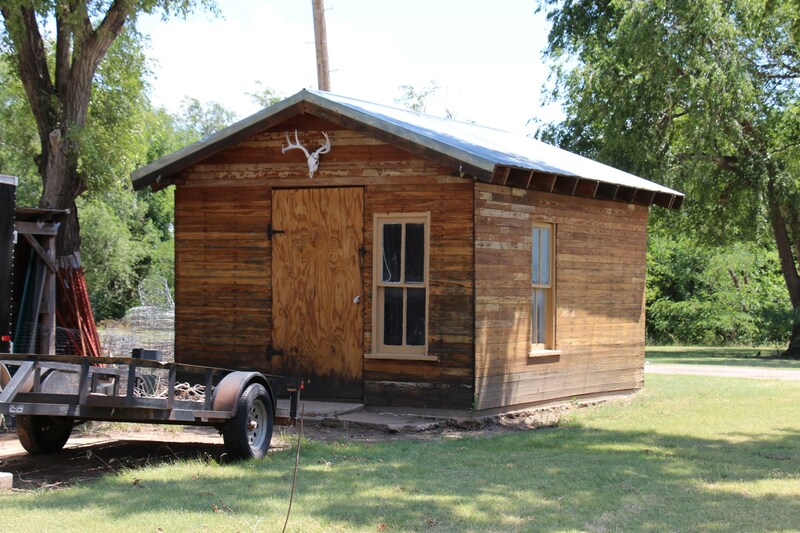 One of the sites is vacant and would make a great location for a shop building and the other site includes a beautiful shed and lean-to storage area. These sites are wide open for you to do anything with it you would like. They could be used for a huge garden area or make it a nice place to just sit and relax. 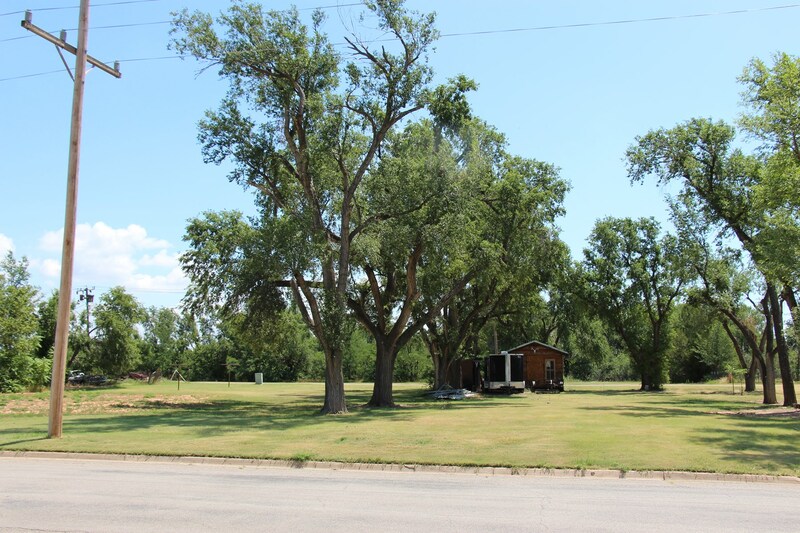 There are large mature shade trees and a nice outbuilding that could be used for whatever you would like. Let’s start our property tour at the front door of the main house. 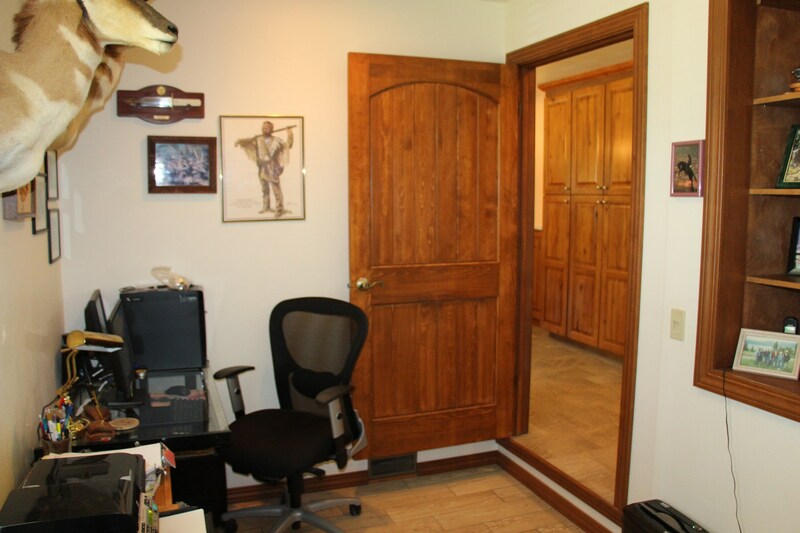 The front door enters into the amazingly large and well decorated living room. 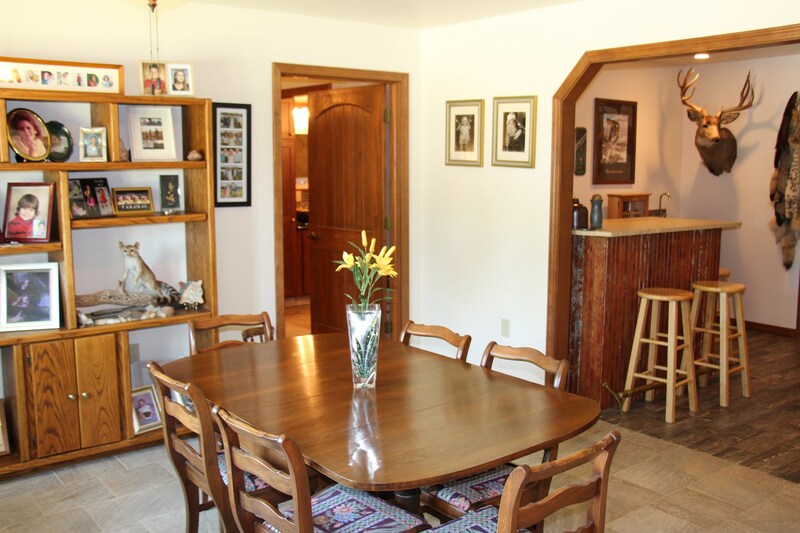 Please see the photos, as this description doesn’t do justice to the beauty of this home. 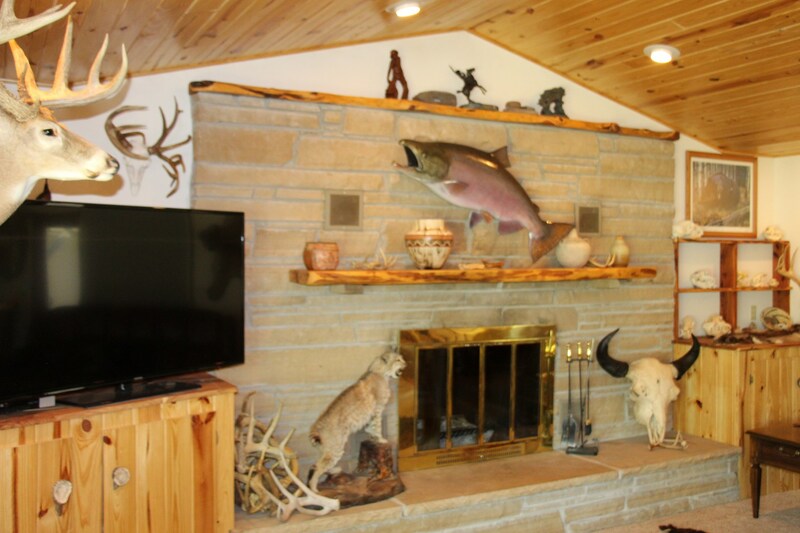 The living room has a stone fireplace with a gas starter. The cedar fireplace mantel matches the woodwork on the built-in cupboard on each side. The ceiling is made of beautifully stained and finished wooden planks. The floor is carpeted. 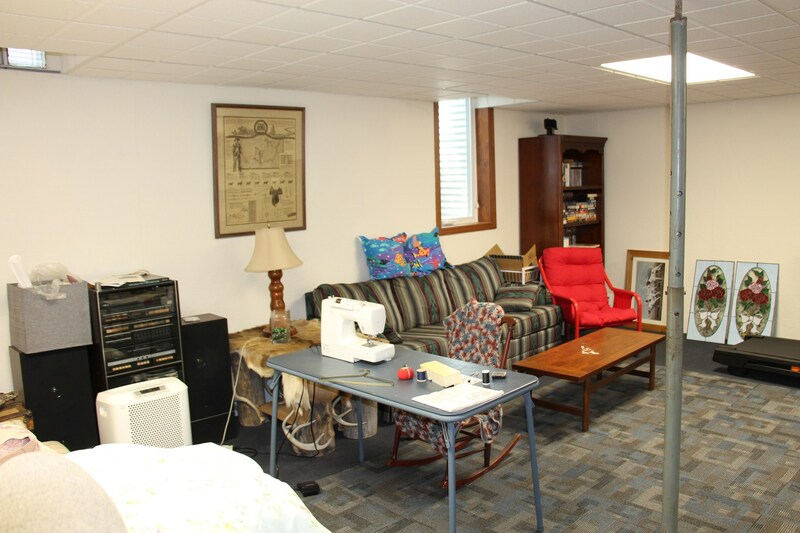 The entrance to one of the basements is in the living room. Again, the cedar railing and wood matches the woodwork throughout the living room. 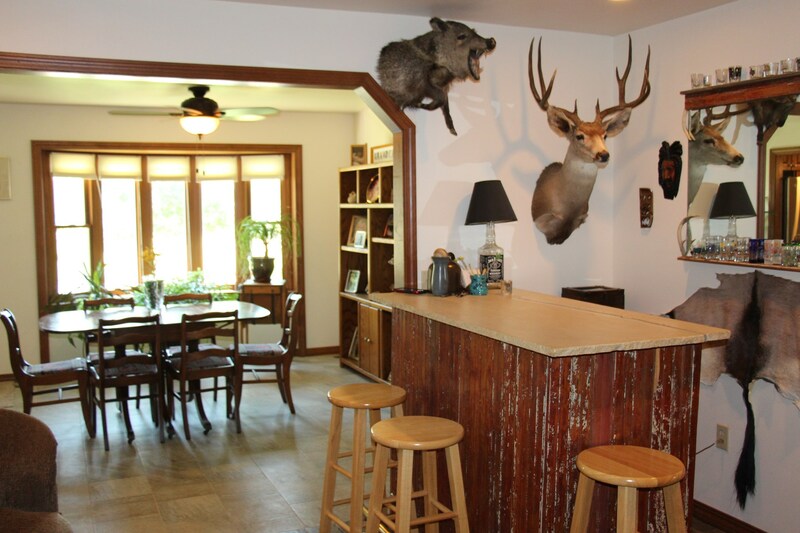 As you leave the living room there is a small wet bar area. This would be great for entertaining friends and family. As you leave the bar area you enter the dining room which also has an outdoor exit. 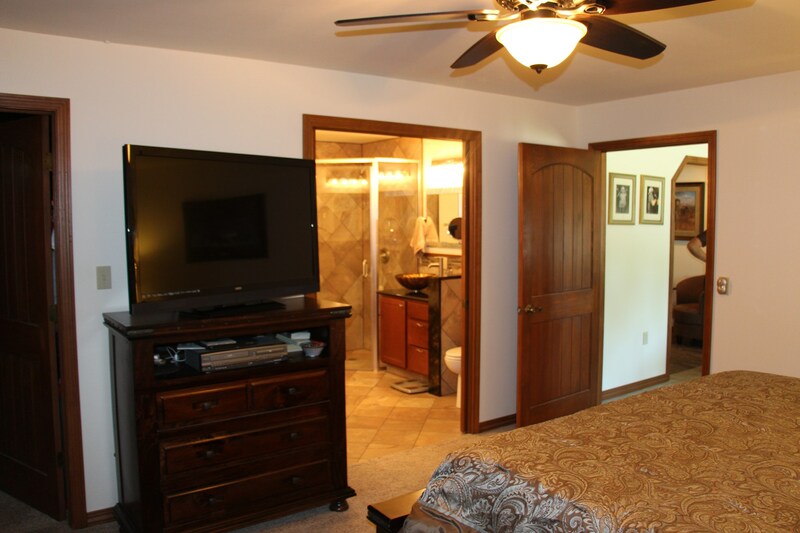 This room has beautiful tiled floor and wonderful bay window. 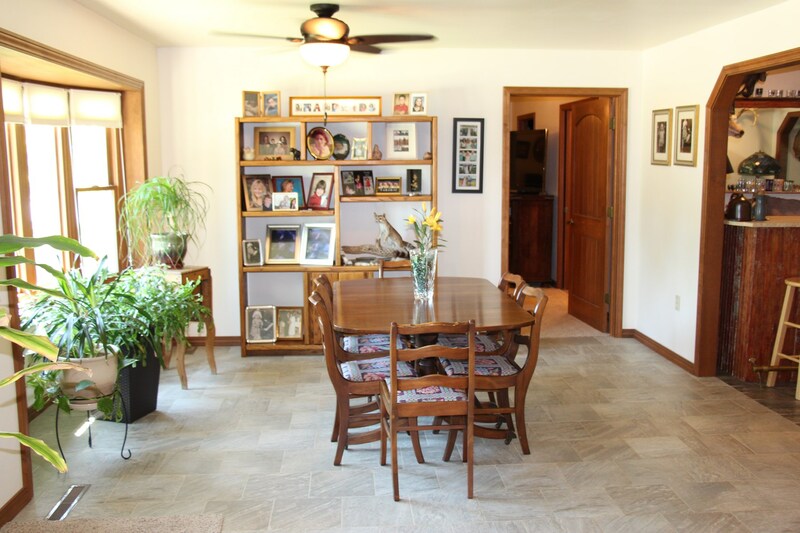 There is ample room for a large dining room table and everything that goes with it. 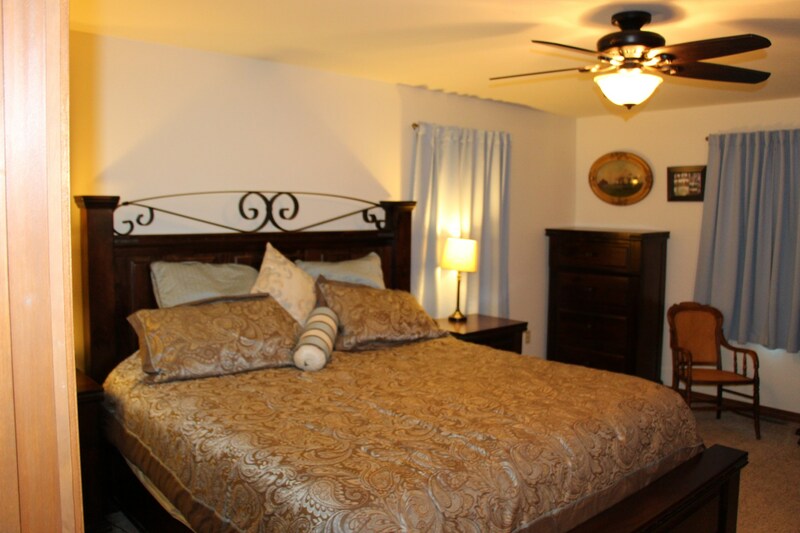 The master suite is at the south end of the home. 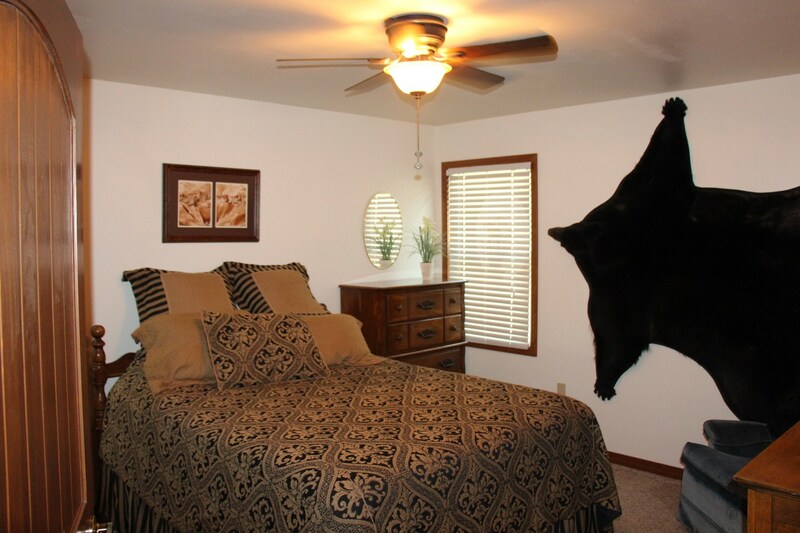 With a master bedroom like this, you rarely need to leave the room. 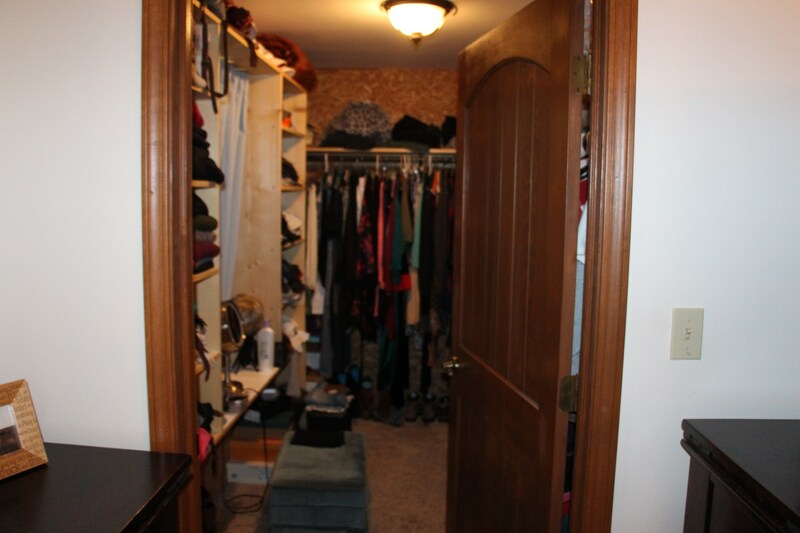 It has lots of space for a king size bed and the cedar-lined walk-in closet is to die for. 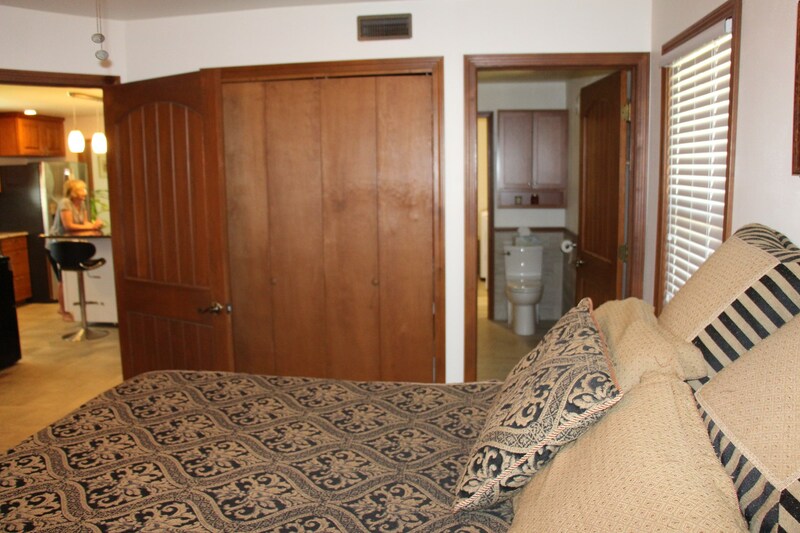 If that were not enough, the bathroom is awesome. 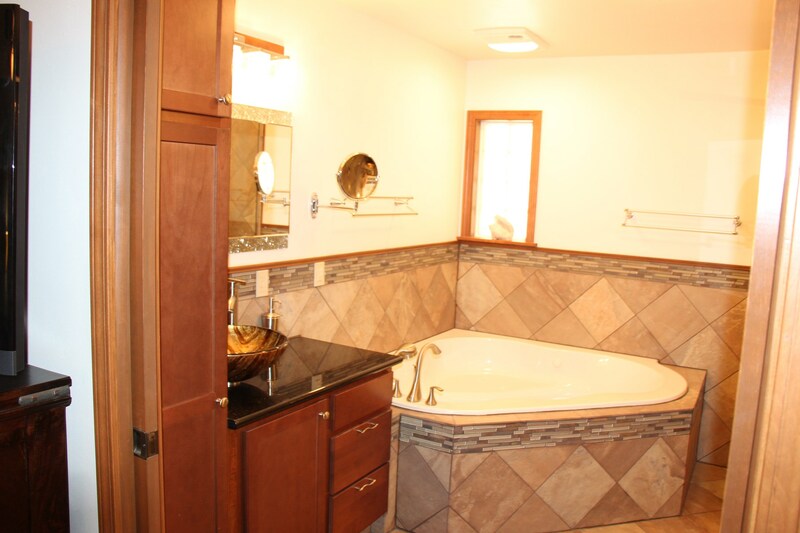 There are two separate sinks, a luxurious tub and a nice sized shower. 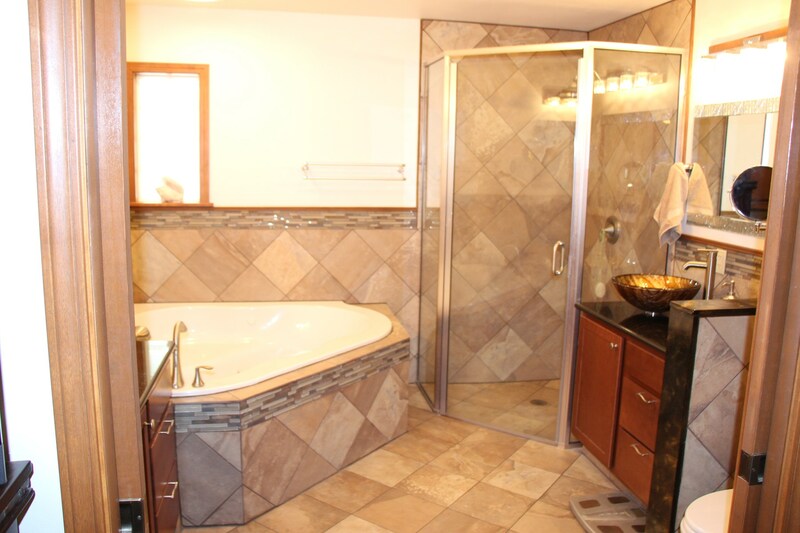 The shower is tiled and the tub is tiled as well. 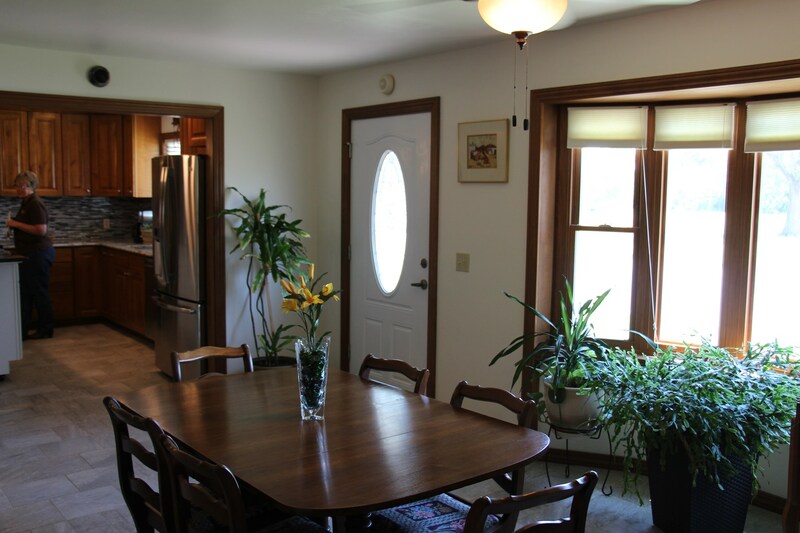 To the north of the dining room is the very efficient kitchen. 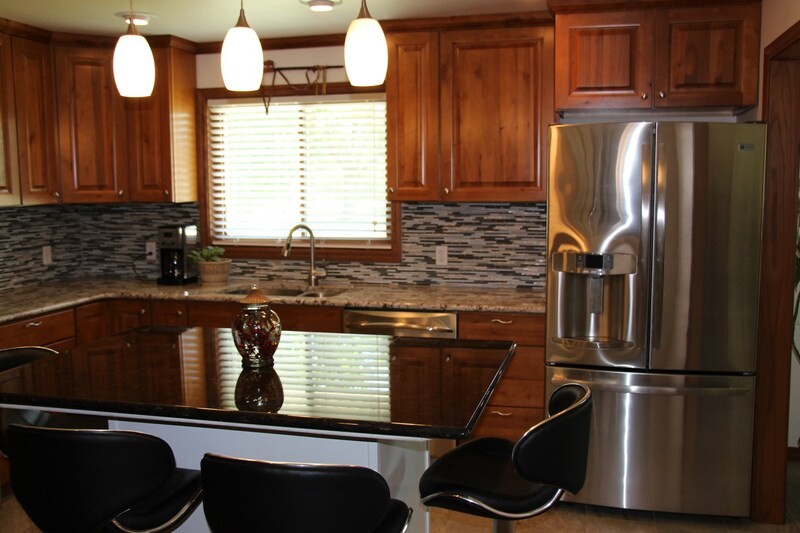 The stainless-steel appliances, gas range, refrigerator, dishwasher and microwave are included. The unique feature is the moveable bar. It is on wheels and you can move wherever you want it, then lock the wheels and it will stay put. 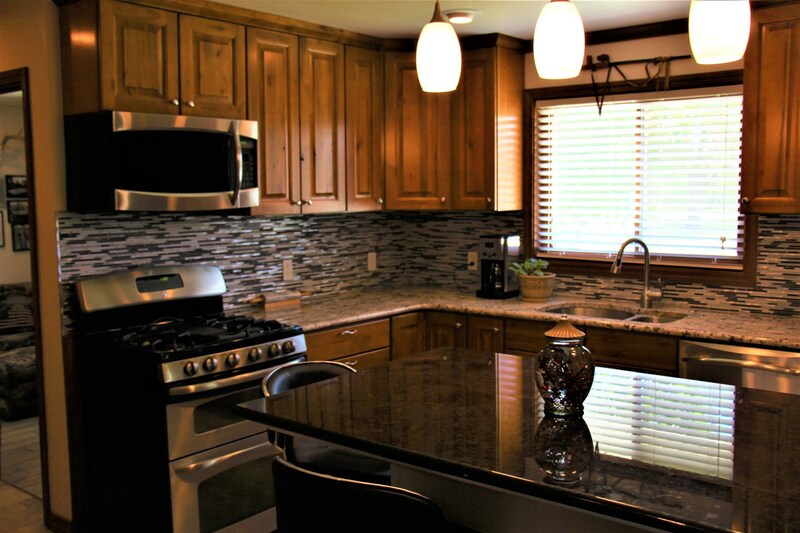 The new countertops are granite and they are so nice and easy to clean. 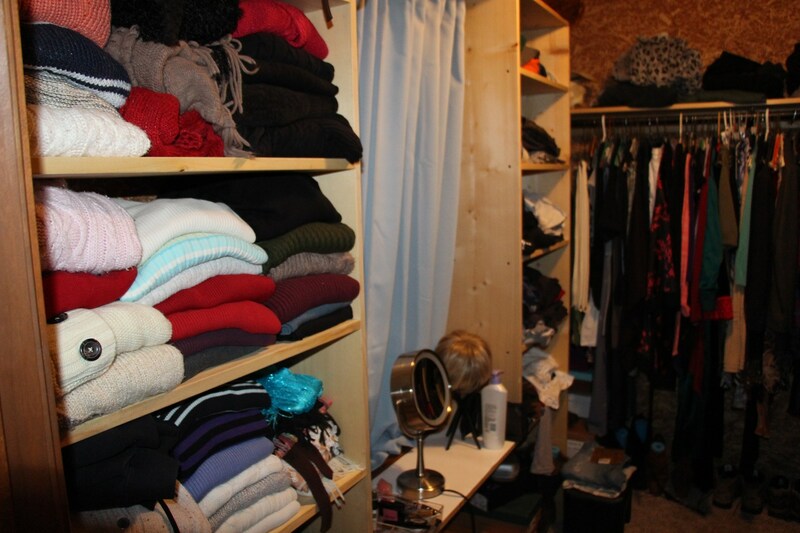 The new cabinets have roll out shelves for additional space and ease of use. Continuing north there is another bedroom and bath. 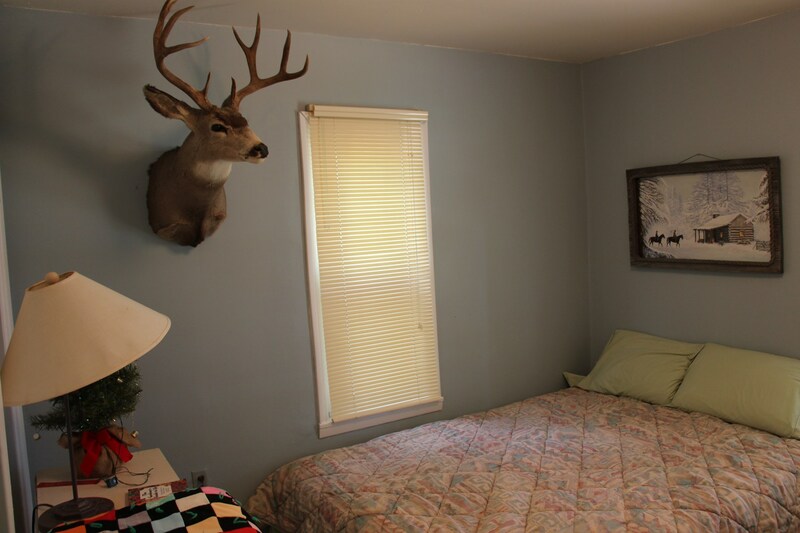 This bedroom room is beautifully decorated and very well arranged. 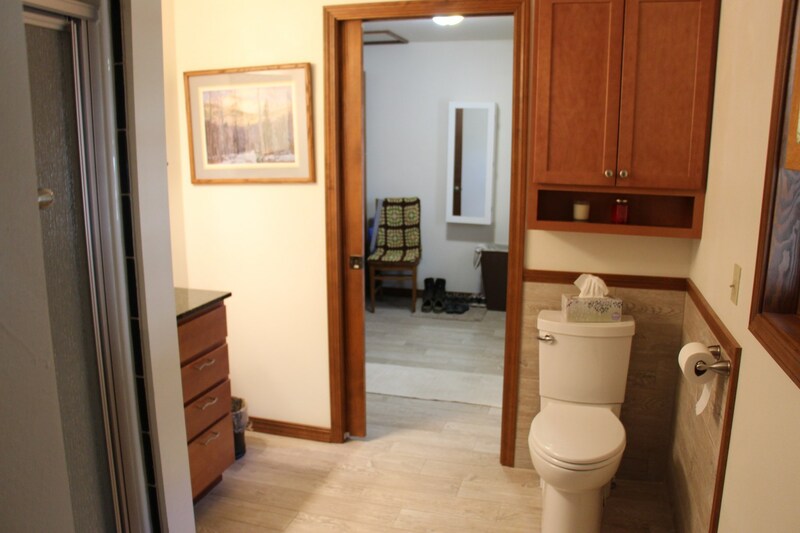 The tiled floor bathroom is attractive and spacious. 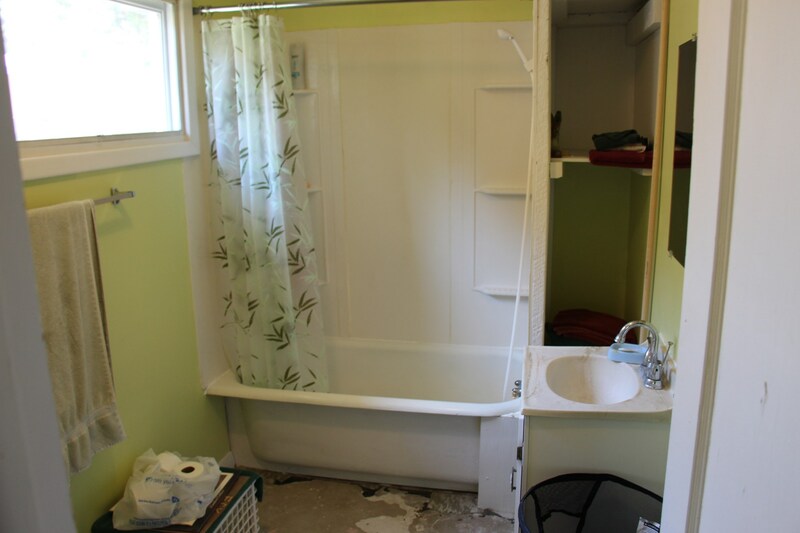 Off this bathroom is the laundry/mud room. 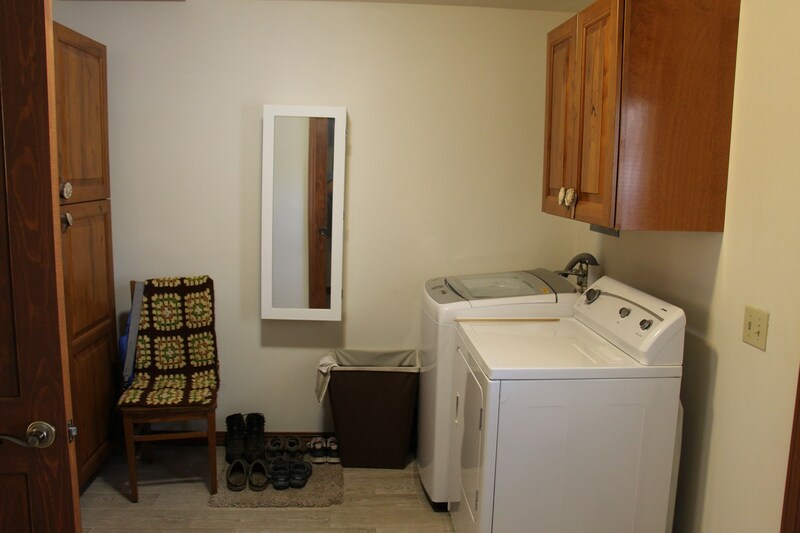 The washer and dryer go with the home also. 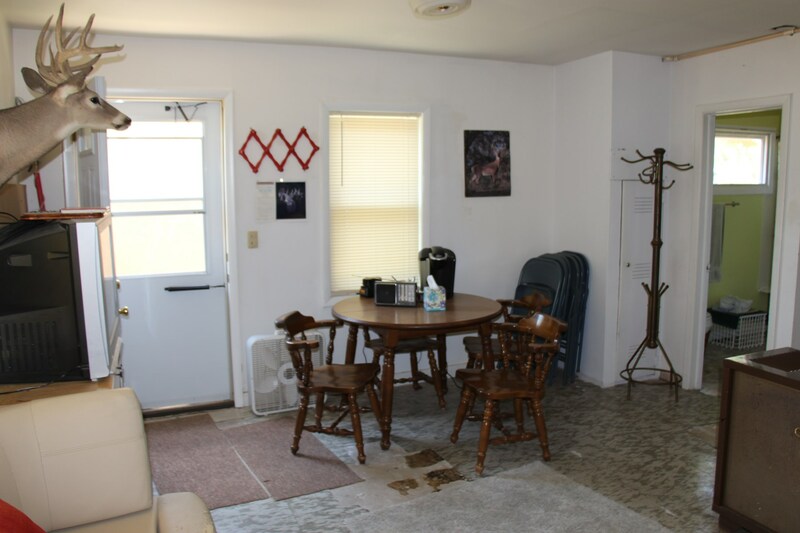 There is a room off the kitchen- which would make a great office space or a den area. This is a very comfortable space. 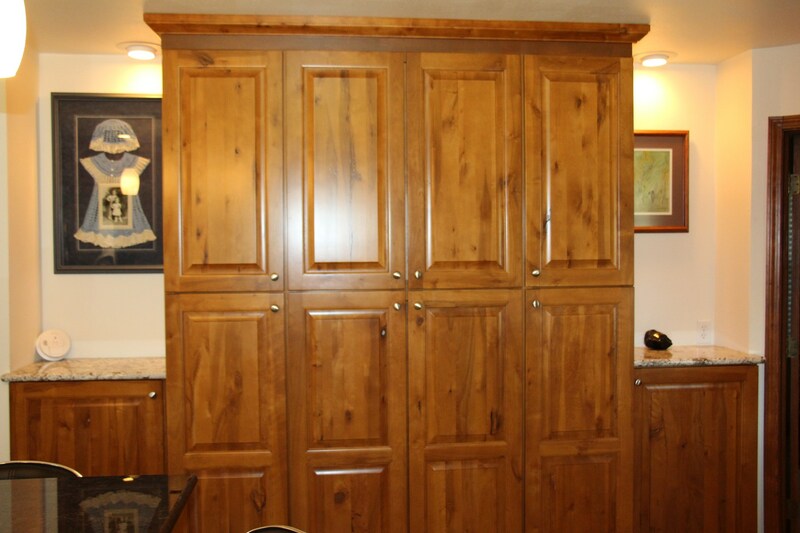 The built-ins in this home are not only beautiful but very user friendly- many of the cupboards have pull-out drawers. 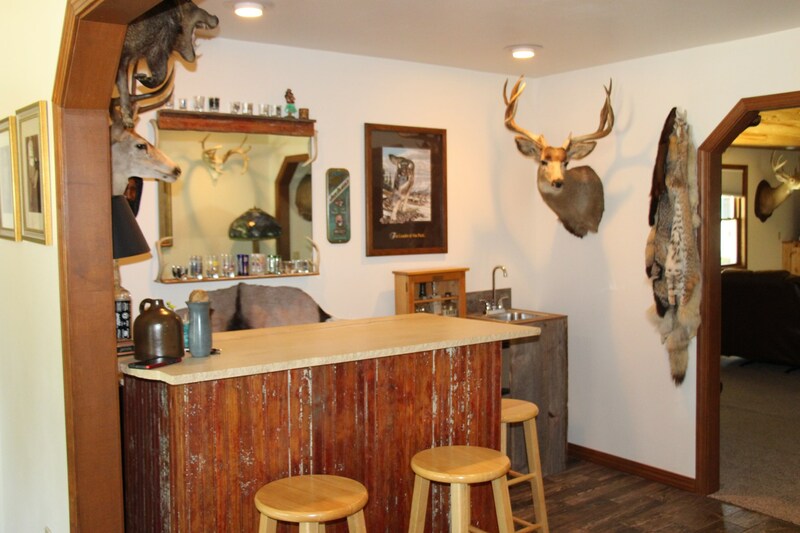 The antler handles give this home a rustic feel. 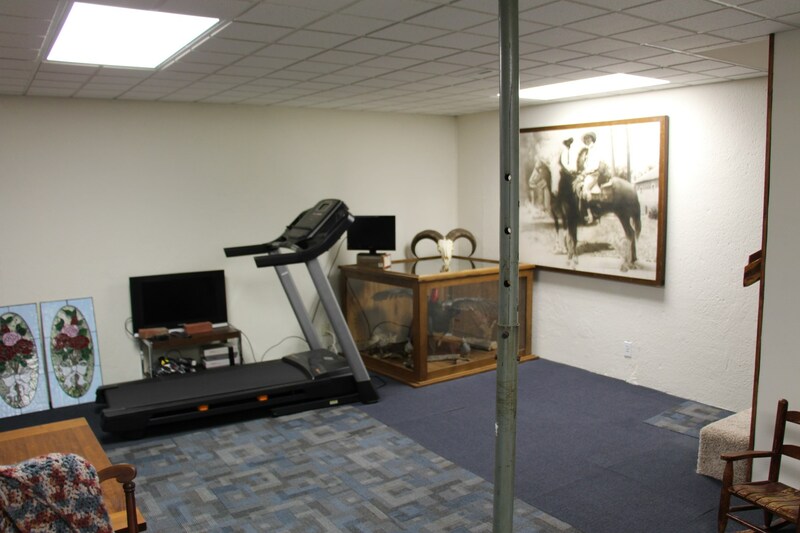 The spacious west basement is a room that you could use for anything, such as another bedroom, a hobby room, a family room or an exercise area. 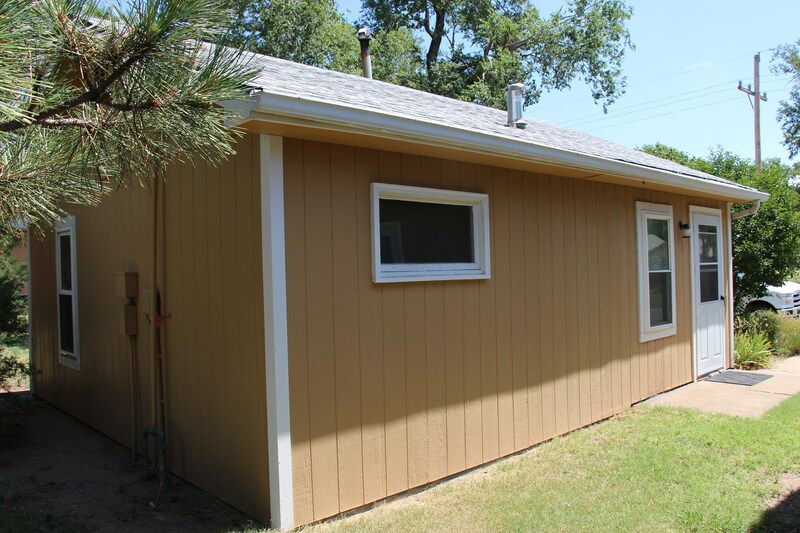 There is also a second basement towards the north end of the home that houses the high efficiency central heating and air conditioning unit and water heater. 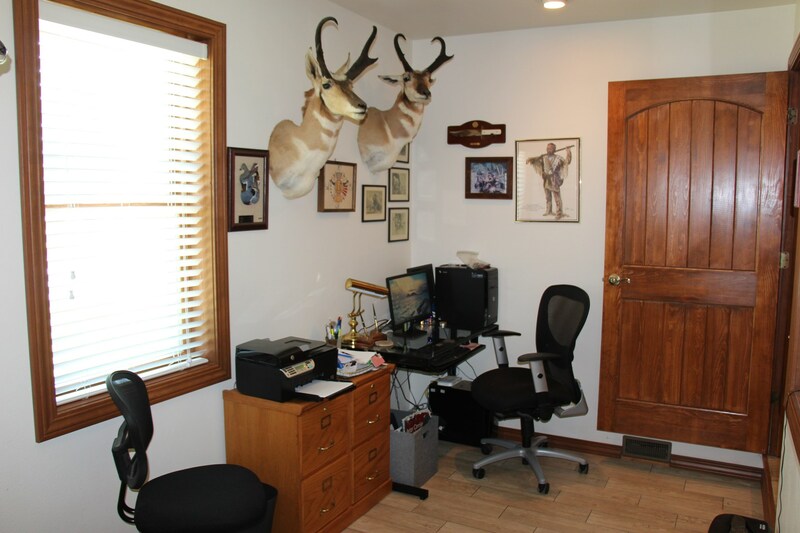 There is also an area that can be used as a nice sized “Man Cave”. 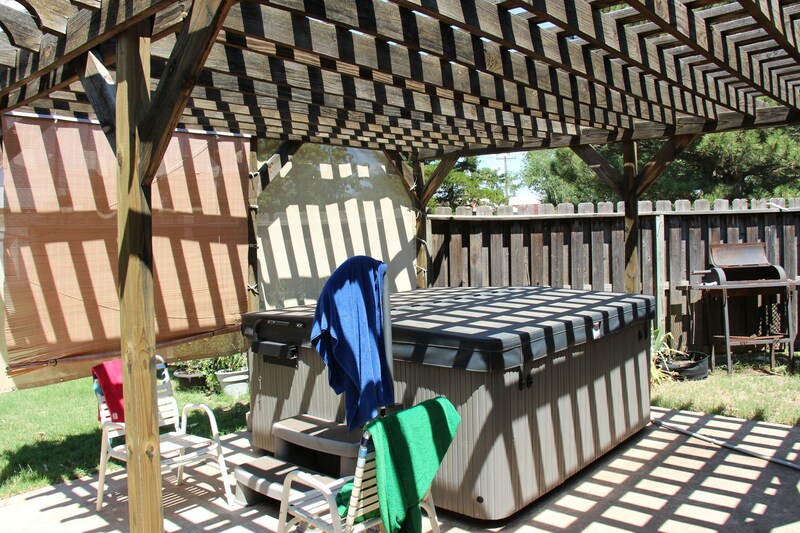 This home has so many unusual amenities, and has been taken care of very well, makes this a rare find. 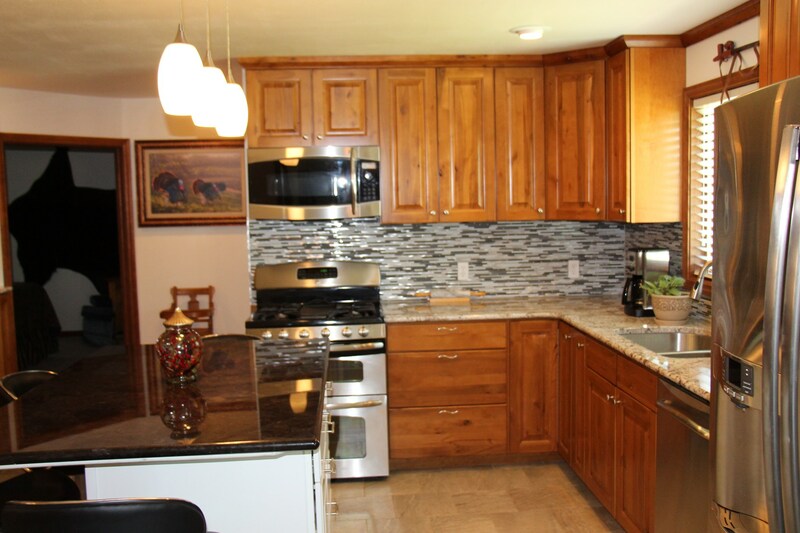 You must come and see it, to understand what a great home this is with so much potential. So now let’s go outside. There are mature fruit trees, producing berry bushes, and shade trees that make this a wonderful yard and fun to keep up. There is plenty of space for a garden if that is what you are interested in doing. 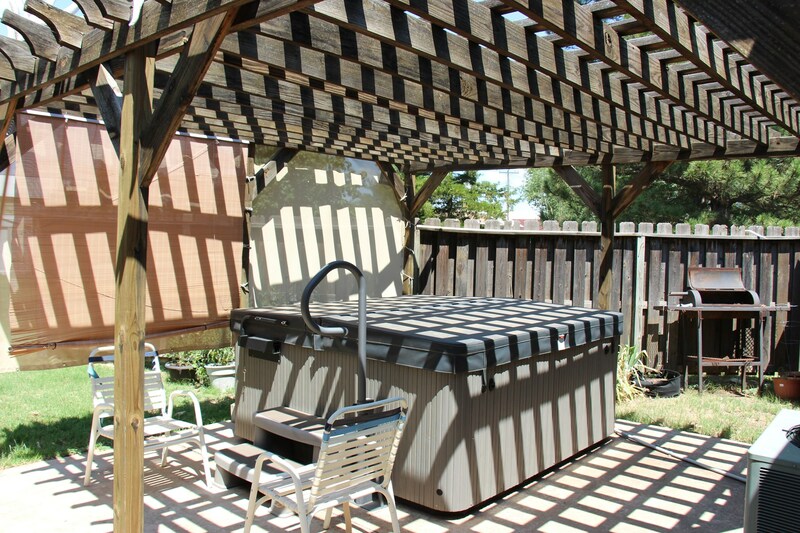 And after you are tired of working you can use the wonderful hot tub that is located in a shaded patio area. 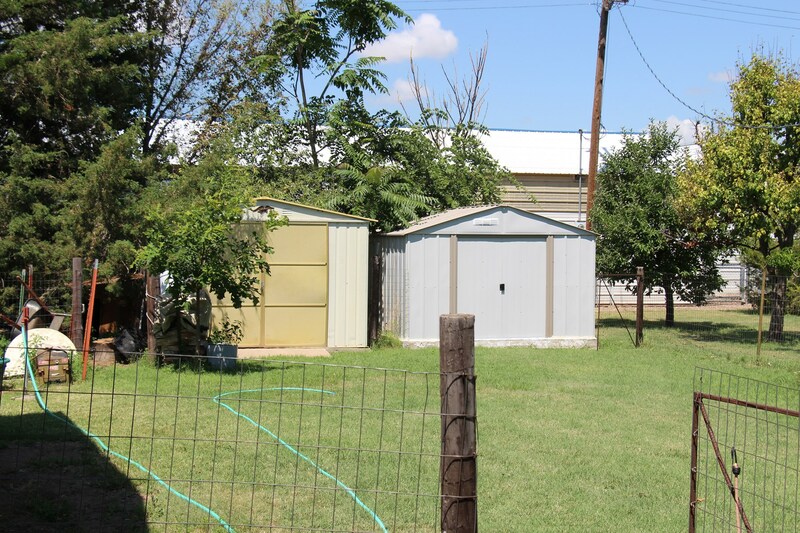 There are 2 out buildings for all of your garden and lawn equipment. 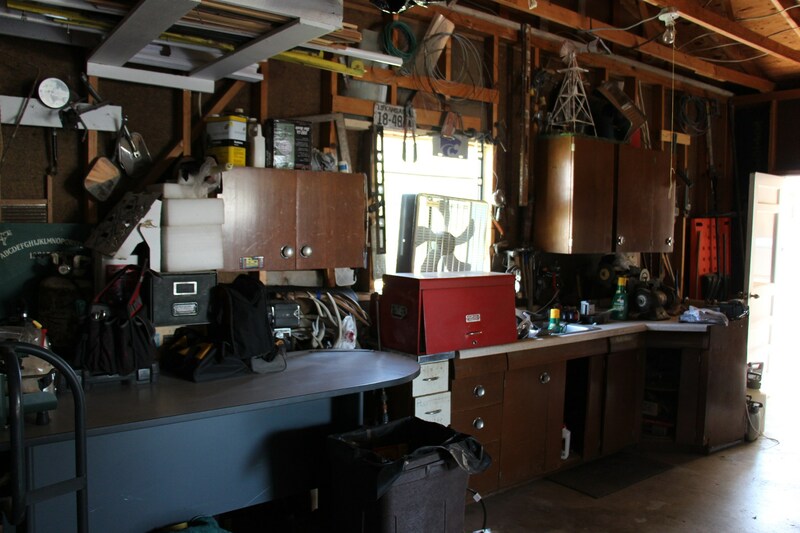 There is an unattached oversized 2 car garage, that is just right for the handy man to put this tools and supplies. 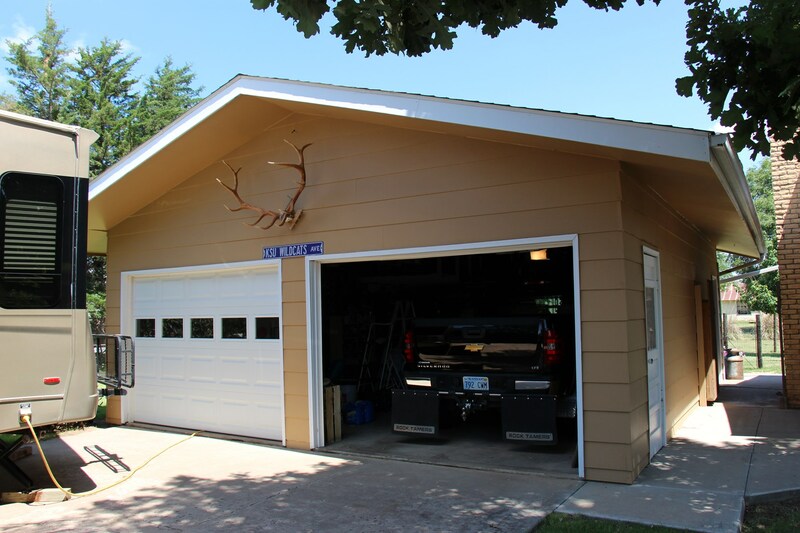 The garage faces south and includes a driveway that loops back to 10th Avenue. This makes a great area to park and RV or camper. 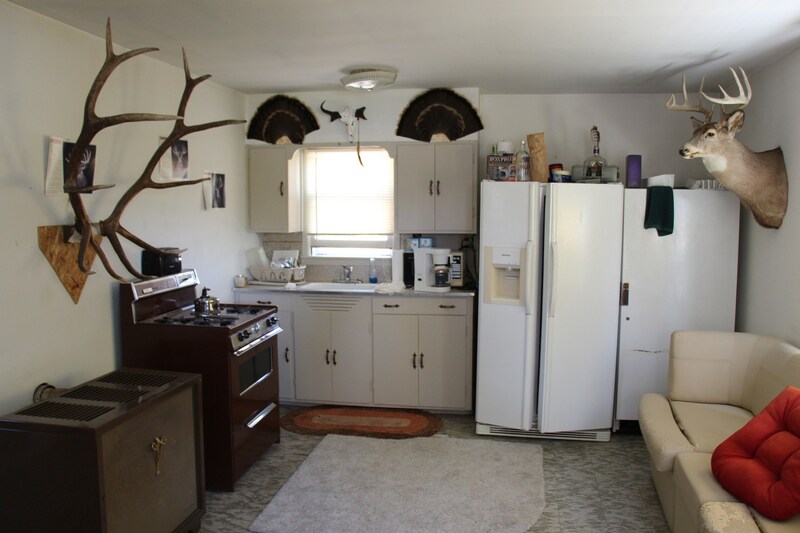 For the mother-in-law cottage (hunting cabin), located just north of the main house, there is a kitchen with a dining area, living area, a bedroom and a full bath. 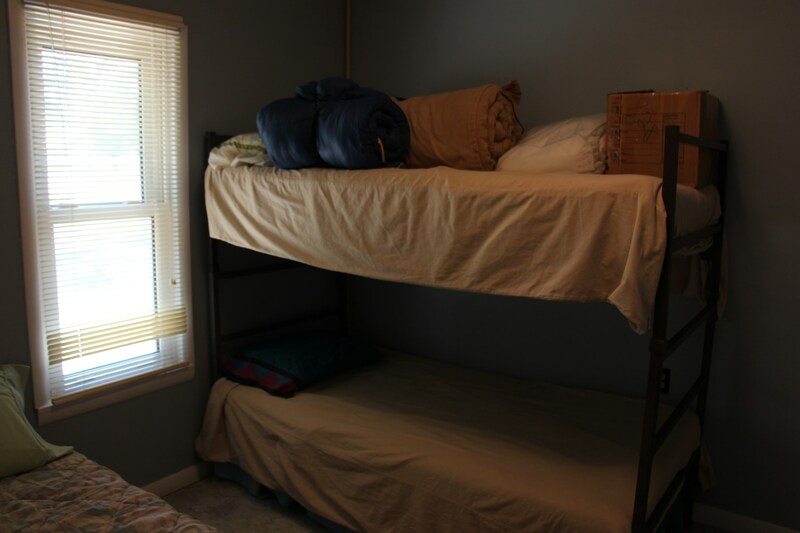 This would work well for visiting relatives or as a bed and breakfast. 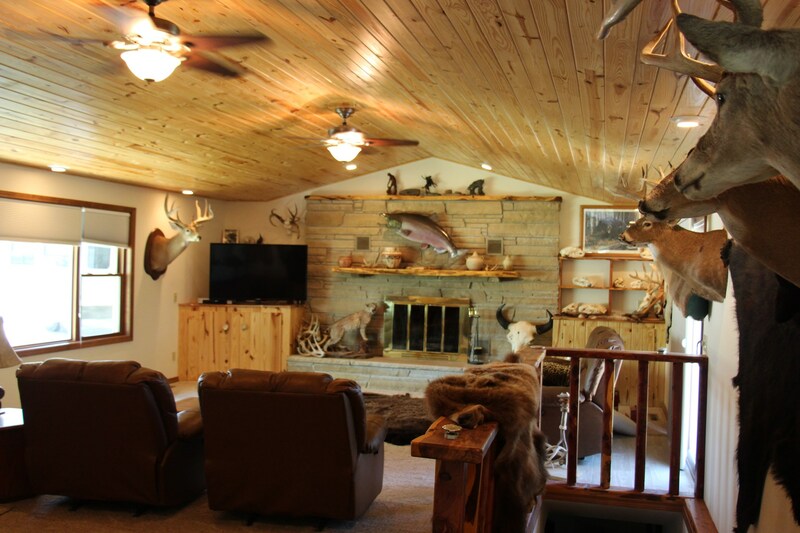 The Ashland area is also popular for hunters, sportsmen, outdoor enthusiasts, photographers and many others that come to the beautiful Red Hills area of Southwest Kansas. 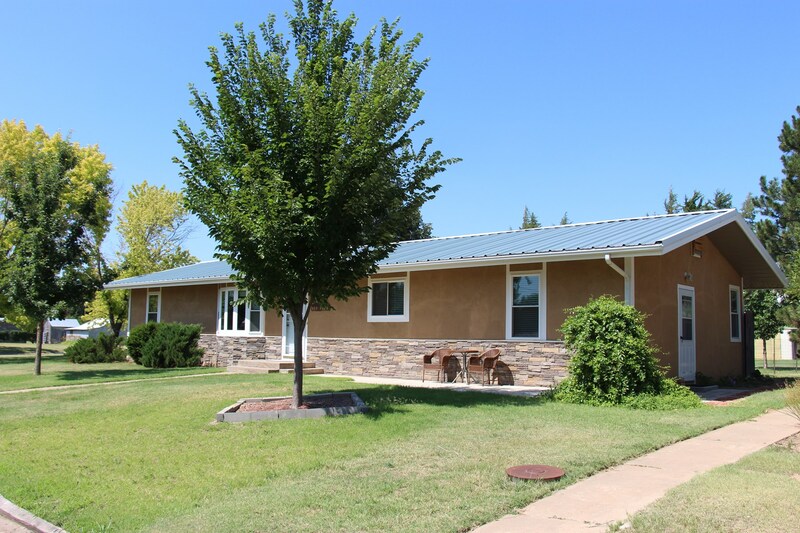 Ashland is very popular for farmers, ranchers, retirees, hunters, outdoors enthusiasts and others that are looking for a safe place to live in the Southwest. This property could be an income producing rental home for the sellers and it would make a very nice home to raise a family or for seniors wishing to retire in a very friendly, safe community. There is much to see and do in the Gyp Hills area of Kansas. Bring your camera to capture the beauty of this remarkable area of the Sunflower State. Many come to the area to enjoy nature by visiting the Big Basin Prairie Preserve, or Clark State Fishing Lake while others enjoy the history of the area in establishments such as the Hardesty House Hotel and many other attractions. Golfers may want to try the 9-hole 'Ashland' course at the Ashland Country Club facility in Ashland, Kansas. It features 3,185 yards of golf from the longest tees for a par of 36. The course rating is 70.2 and it has a slope rating of 121. The Ashland golf course opened in 1980. Ashland is a small town of about 870 people, but with lots of warmth and charm. 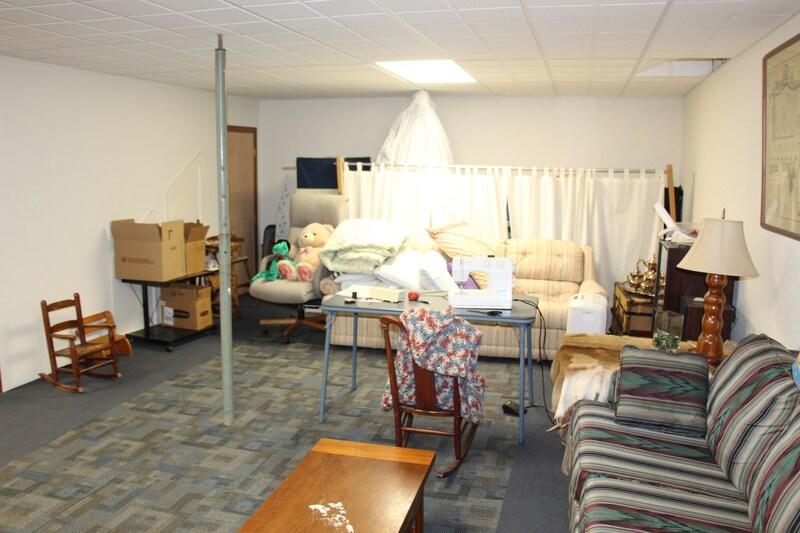 As quoted on the City of Ashland website: 'Whether you are just passing through or looking for a place to call home you will find it in Ashland. The community offers a sense of family, a commitment to service and a slower lifestyle in one of the most beautiful settings in Kansas. Travel the Red Hills, stop in and visit with the local merchants on our historic Main Street and chat with the locals. If hunting or fishing more to your liking. Ashland has both with a large population of deer and Clark State Lake. Take some time and allow us to show you a lifestyle worth sharing.' 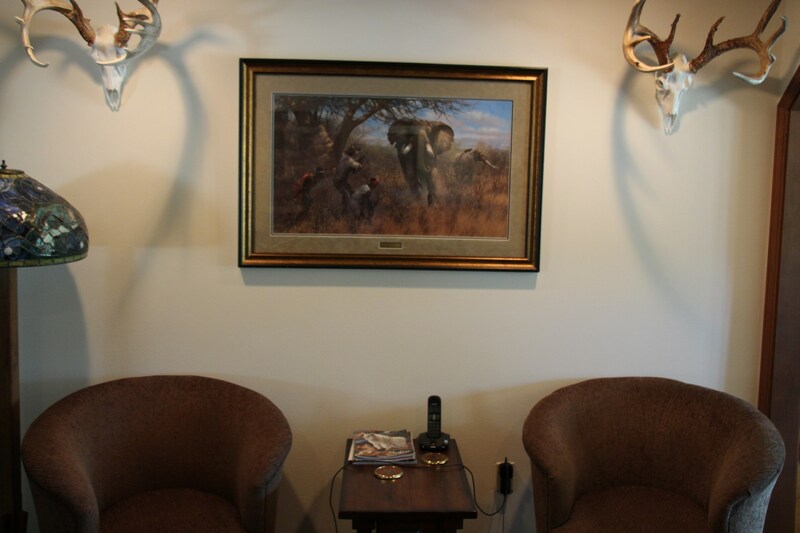 Being able to come to town and grab breakfast or lunch at the Ranch House Café or a relaxing meal at the new Red Hills Bar and Grill and then return to very homey place to rest and relax is what a vacation retreat is supposed to be! Come to Ashland and see what rural America is really like! It will be like stepping back in history to a better time and place! Take some time to watch a glorious sunset or drive north through the beautiful Red Hills to Clark County State Fishing Lake for some fishing, hiking or shooting photographs. 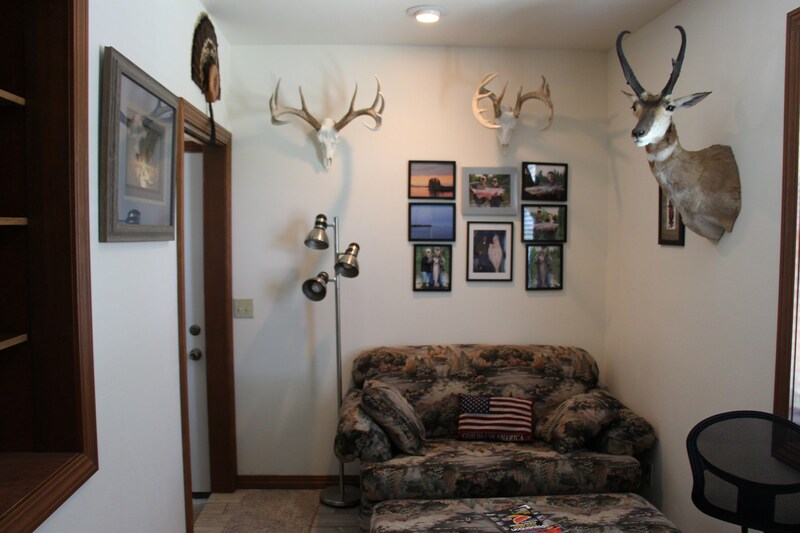 Hunt the 12,000 acres of Walk-In Hunting areas nearby. Make new friends or renew old acquaintances. 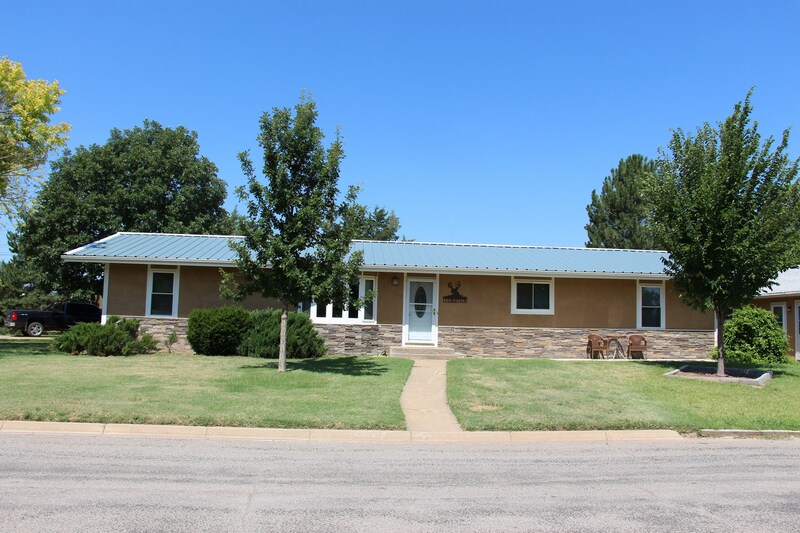 To view the property or to gain additional information, please reach out to listing broker Vanita Blundell at our United Country Red Hills Realty & Auction, LLC office, www.ucredhills.com at 600 S. Central, Coldwater, Kansas 67029. Thanks for your interest in this property. If you know of anyone thinking of buying or selling real estate please let us know.